I've been giving into my Peter Pan cravings for the past few days. As I was picking up a snow treat of a dozen doughnuts for my colleagues, I nearly got smacked by the front door when I was busy reading a sign that said "Pączki on Thursday." God, I love my neighborhood. 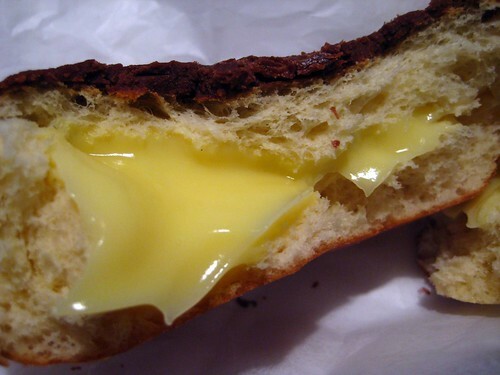 Pączki are a Polish Mardi Gras week treat, typically served on Fat Thursday (yesterday), and sometimes on Fat Tuesday. It's a yeast doughnut filled with fruit jam or Bavarian cream, sugar dusted or iced. Apparently the difficulty of making your own homemade pącki leads many Poles to just buy it from bakeries, and with a five days left of Mardi Gras, there has to be more around Greenpoint. I believe a weekend of pącki tasting may be in order. Of course I stopped by Peter Pan yesterday, after work because morning sleepiness tends to make me forget things, and though they weren't fresh out of the oven, I had to get one. 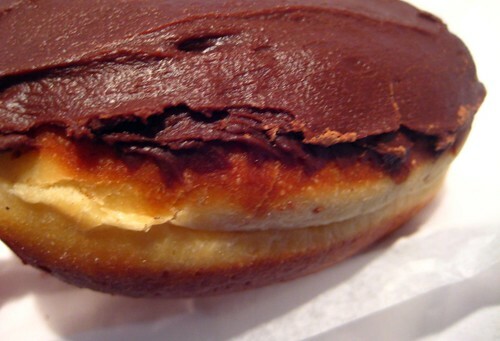 Peter Pan was offering a sugar dusted prune-filled, and other combinations filled with Bavarian cream, I chose chocolate frosted. For $1, I ate my third delicious doughnut in two days. Soft yeast dough holding a good amount of sweet Bavarian cream, holy Moses! I can only imagine the deliciousness of a fresh one-a thought that is making me drool. For one thing, the frosting would be a bit better; mine had gotten the hard crust that happens from a day of sitting around. I hope they are serving these through Ash Wednesday, I've been looking to gain 5 pounds of doughnut.